Much sought-after personal advice on the use of medicinal herbs from Europe's most popular herbalist. Comprehensive and infomative, this time-honored herbal remedies have been shown to cure even some so-called "incureable" diseases. The book about herbs, which was first published in 1980, has become a phenomenal success. So far, the Publisher Ennsthaler Verlag has sold over nine million copies of the book which has become a classic among health guides and has been translated into 27 languages. 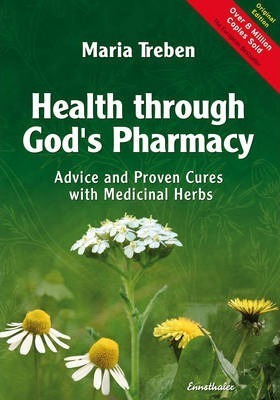 It gives a detailed description of 31 herbs, ranging from agrimony to yarrow. The author explains how to prepare teas, tinctures, body pastes, baths and juices. These herbs are native plants, such as yarrow or ribworth that grow in meadows and woodlands, and are very robust. The enormous success of Maria Treben ist most likely based on the fact that she has restored an ancient knowledge that had already largely been forgotten. Maria Treben (1907 - 1991) is known as the pioneer in Austrian naturopathy. Living in tune with nature was her philosophy. Maria Treben was a highly acclaimed and much sought-after lecturer in Europe. Wherever she spoke, the auditoriums were filled to overflowing with enthusiastic crowds.